“As Guardians of Childhood we count on our team for the brightest medical minds, the most compassionate care, and the latest and most innovative treatment options for children, ” says Joan Magruder, hospital president. U.S. News & World Report has again ranked St. Louis Children’s Hospital-Washington University School of Medicine among the best in the nation. The publication evaluated pediatric hospitals in specialty areas to compile its list of America’s Best Children’s Hospitals. 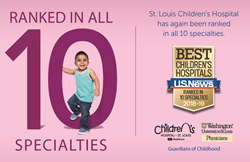 Of the 189 hospitals surveyed nationwide, only 23 ranked in all 10 specialties, including St. Louis Children’s Hospital-Washington University School of Medicine.